Fractions are sometimes a hard concept for kids to understand, and the more visual we can make things the more we can help them get what fraction equivalents really look like. 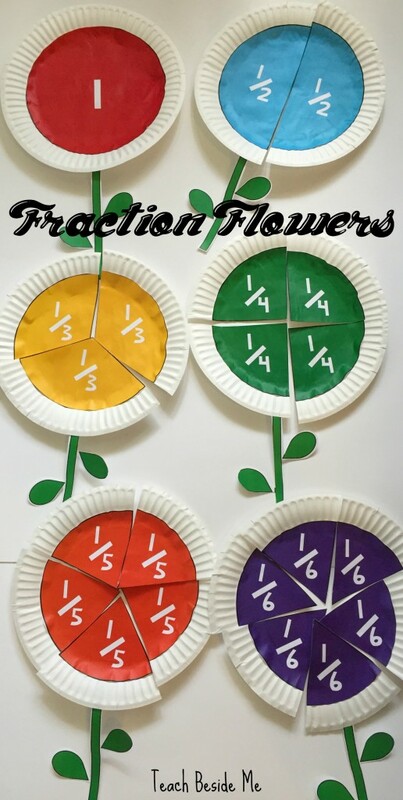 These cute fraction flowers from Teach Beside Me are a great way to do just that. Paper plates serve as the center of the flowers, with one plate kept whole, one divided into halves, thirds, fourths and so on. She has printables you can purchase on her site for $2 to make forming the fraction pieces easier, or you can draw them yourself. Either way, this is a cute, seasonally appropriate way to get kids interested in learning what fractions look like. Do you have any tips for teaching fractions? I’d love to hear your ideas!